This is our model 810 Work Table. 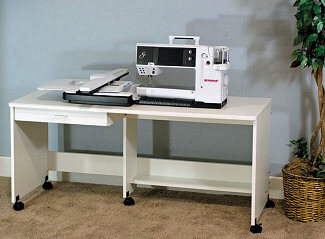 This is a great sewing table for the new larger machines and a must as a training table for classrooms. The height (27") is perfect for both functions. 60" Wide x 19 3/4" Deep x 27" High. Optional leaf extension adds another 15 3/4" to depth. An additional charge applies.